Yesterday I went to Wrigley Field with my friends, Eric and Jessie, who kindly bought tickets as a gift for my birthday. 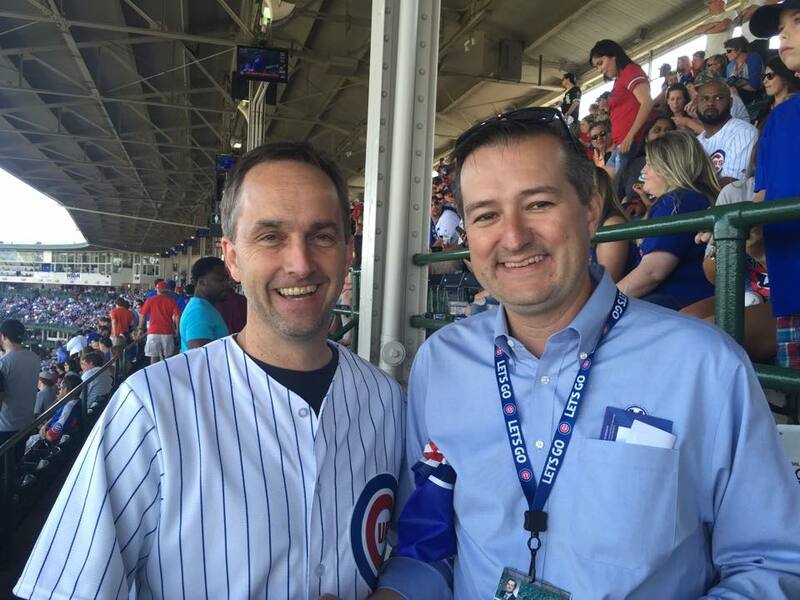 While we were sitting in the upper deck stands, Tom Ricketts, owner of the Cubs came walking down the concourse. He was dressed in a blue oxford button down and khaki pants. He had a sports bag in tow, full of Chicago Cubs baseballs he was passing out to junior Cub fans. As he walked down the concourse, I couldn’t help but tap him on the shoulder, explain that it was my birthday we were celebrating, and ask him if he would mind taking a photograph. In those few moments I learned a few valuable leadership lessons. 1) Children Matter More Than Anyone Else. Tom Ricketts walked the concourse with a bag full of baseballs to pass out to children. He knows that these kids are the ones who will be filling that park for years to come. He also knows that if you take care of someone’s child, you have a customer for life. Maybe this is a stretch, but it reminded me of Jesus telling the disciples to let the children come to him when they thought the kids were more of an annoyance than anything else (Matthew 19:13-14). When I first asked Mr. Ricketts to take a picture with me he said, “Just a minute.” Then he turned to sign another baseball for a little guy who was reaching out to him. It’s more than good business or savvy politics to honor children in this way, it sets an example of giving attention to those who are not in positions of power or influence, but rather to those who may be most influenced by it and are often overlooked. 2) A Firm Handshake and a Friendly Smile Still Mean A Lot. Tom Ricketts wasn’t behaving like a politician. He didn’t have an entourage surrounding him. He wasn’t parade-waving as though he was the center of attention, expecting everyone to notice him. He came across very humble and matter of fact. He seemed like just another guy who was enjoying a day at the ball park. He just happens to be worth a few billion dollars and owns one of the most storied franchises in the history of sports. He didn’t seem the least bit bothered, and while he wasn’t seeking the attention, when he was confronted by a crowd of strangers he quickly acknowledged everyone and gave his full and undivided attention to anyone who asked for it. We are a family of prodigals, each finding our way back to God. And we can learn a lot from one another. Share your story here for Jon to share with others in a future post.